One look at the Gates of Hell and you'll be saying your prayers to avoid an eternity surrounded by fire. 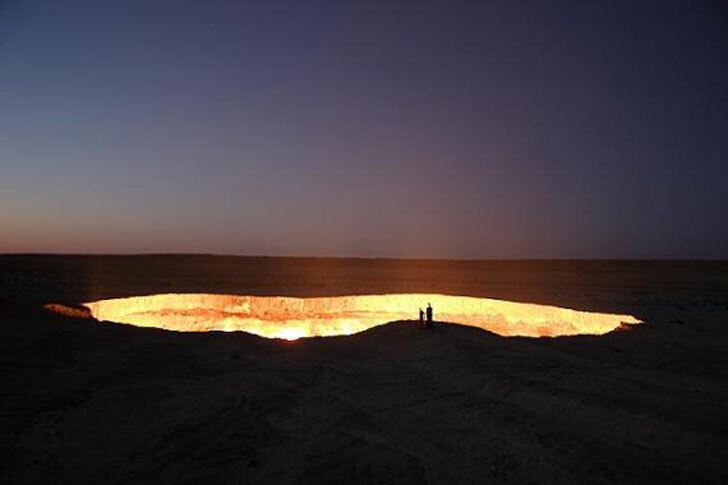 Located in the Karakum desert in Turkmenistan, this fiery crater has been burning away for over four decades, and its arresting glow can be seen for miles once the sun falls. Click ahead to learn more, and to see some of photographer John Bradley's amazing images. So how did this glowing and gaseous crater get there? Unfortunately the burning gates are not a natural phenomenon and the crater is in fact the result of a Soviet gas exploration accident that occurred back in 1971. During drilling, a Soviet rig had fell into an underground cavern and punctured the earth, releasing noxious gas into the air. To avoid an even greater environmental disaster, the Soviets set the natural glass aflame believing it would burn off in just a few days — it has been burning ever since. Agree with other comments. Life gives you hell fire, make electricity. Might as well make the best of a bad situation. Seriously interesting until the satellite picture (8/10) with the tire that must be hundreds of feet in diameter. confused. The satellite view seems to show a tire laying on the ground but if the pit is in the picture it is smaller than the tire? This is large but not that large also. Why do not we seal the bottom of the pit and fill this up. I welcome this idea to capture the wasted heat that comes from this on going fire of fires. It is probable many miles from no where and it would cost more money to get Energy than you could get paid for but I don't know now? Good idea as this can be done to make electricity via steam, there is a lot of hot air released. why is no one investing in recovering energy from this waste heat? Couldn't we adapt passive heat recovery technologies to this particular situation? What a waste of energy resources. The crater measures a staggering 197 feet in diameter and is nearly 70 feet deep. 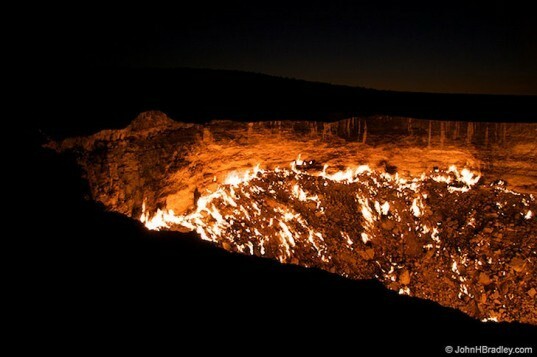 The hole is known as the Darvaza Gas Crater, or the "Gates of Hells" by locals, and the crater can be seen, and smelt, for miles around. As Bradley reports, "The smell of burning sulfur can be detected from a distance and becomes quite strong as you near the hot edge of the crater." So how did this glowing and gaseous crater get there? Unfortunately the burning gates are not a natural phenomenon and the crater is in fact the result of a Soviet gas exploration accident that occurred back in 1971. During drilling, a Soviet rig had fell into an underground cavern and punctured the earth releasing noxious gas into the air. To avoid an even greater environmental disaster, the Soviets set the natural glass aflame believing it would burn off in just a few days -- it has been burning ever since. The crater during the day.